Janet Gallagher is an art teacher who is presently working at the Department in the certification office. Two people recently commented on how quickly the turn around is from the certification folks. Perhaps it is because of Janet’s creative skills. My son, Brett is a first year second grade teacher in the Philadelphia city school system. He is also responsible for teaching the students art, since they do not have an art teacher in their building. Since I am an art teacher, he is looking to me for assistance. I can provide ideas, books, etc., but he also needs supplies. If anyone has anything they could donate to the “Brett is now teaching art” fund, we would really appreciate it. 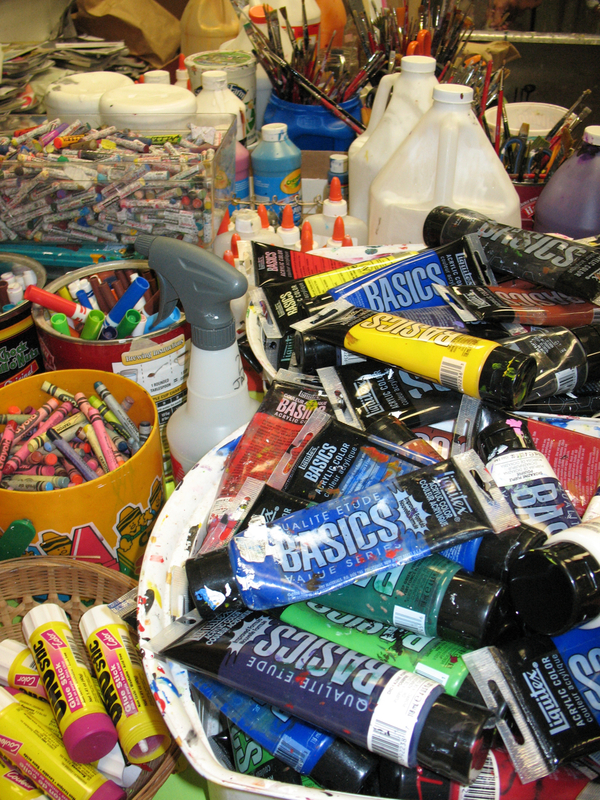 Paper, pencils, markers, crayons, erasers, recycled materials such as paper towel rolls, we will take it all! I will arrange to get it from you. Contact me by phone 207-680-0493 or email jangal55@gmail.com. Think how excited these young inner city students will be when they get boxes of supplies from Maine! I happened to have a box filled with the styrofoam packing peanuts. The off white ones are actually biodegradable and if you put a spot of water on them, they will stick together and can be used for sculptures by even young children. I gave Janet a small box of them and suggested she ship those to PA since they would be light to mail. That kind of stuff would be helpful to Brett. Thank you to Suzanne Southworth, Camden Hills High School art teacher, for writing this blog post! As many of you know Maine College of Art (MECA) held a workshop for art teachers on Tuesday December 8th. The schedule was wonderful and the MECA faculty and staff were gracious hosts. The day’s events went off without a hitch. In the morning we visited Portland Museum of Art to view the work of Jenny Holtzer. Then we went over to MECA for a guided tour of the facility. Lunch was at MECA’s café, which was excellent, and it gave us an opportunity to connect with each other and the MECA staff. After lunch we split up into groups to partake in a three-hour art-making workshop. I took “The Gift” with Ian Anderson. 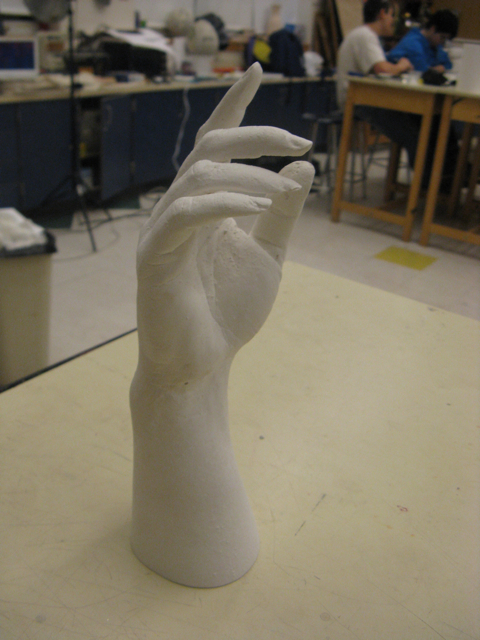 We made plaster casts of our hands using Alginate for the mold. After the workshop we were invited to a reception, which was another great way to connect and ask questions and enjoy a little Portland flare. Following the reception was a lecture at the Holiday Inn. The day’s event was wrapped up with a public display of Holtzers work splashed up on the wall of the Portland Museum of Art. It was pretty neat to see so many people gathered in Congress Square for this event. I was really impressed with Grace Hopkins, Admissions Director for her attention to detail. They offered a hotel room and travel reimbursements to the people who had a long way to travel. I was very impressed with the down to earth and friendly attitude of the faculty and staff. Overall, a class act. Thank you MECA for a great day! You are currently browsing the me arts ed blog archives for the day Monday, January 10th, 2011.